RDO Equipment Co. recognized greater opportunities in shortlines and put dedicated resources on the job to manage decision-making across this 28-store farm equipment dealer group. In 2009, Rogness was charged with the oversight and management of all ag shortlines for the firm’s 28 agricultural stores. Though Rogness is now retired from this position, RDO continues to use Rogness' shortline strategy when evaluating the performance and potential of new shortlines. 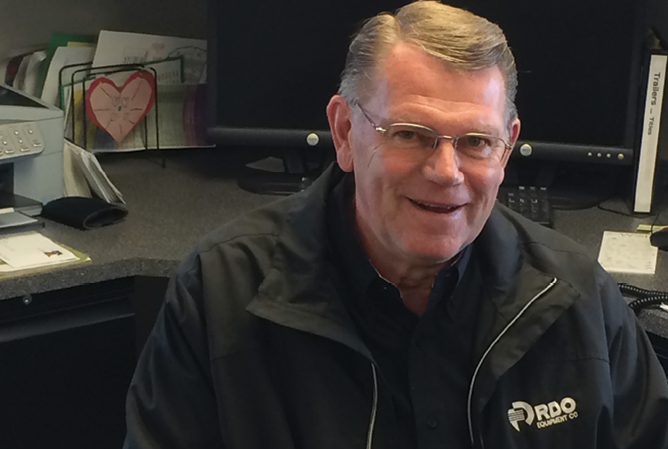 The RDO Shortlines office is located on the mezzanine level of the same Fergus Falls, Minn., location he previously ran as dealer-principal. It’s a big job for an office that oversees hundreds of suppliers to meet the needs of customers from the orchards of California to the big grain producers of the Dakotas. The key, he says, is applying and controlling a process that works for most needs. RDO's shortline strategy is driven by a motto of the 5 P’s: processes, protocols, procedures, people and profit. Lee Rogness, the dealer principal of Interstate Inc. (Fergus Falls, Minn.) before selling to RDO Equipment Co. in 2008, knows the power of shortlines. His business “survived on shortlines” during transitions between majors in the tumultuous 1980s, before Interstate inked a contract with John Deere. RDO has worked diligently to find common ground between its needs and that of their suppliers to make it easier to do business with one another. As part of RDO’s acquisition of Interstate in 2008, Rogness remained as store manager for 6 months to assist the company’s new employees in the transition. Success in Shortline Machinery is a new regular feature in E-Watch, our bi-weekly e-newsletter. It is brought to you by Versatile. Versatile, celebrating 50 years of 4WD production, is a full-line equipment manufacturer known for building products that are simple, reliable and easy to service and maintain. Versatile is seeking independent-minded dealers capable of selling and servicing equipment for large scale farming operations. 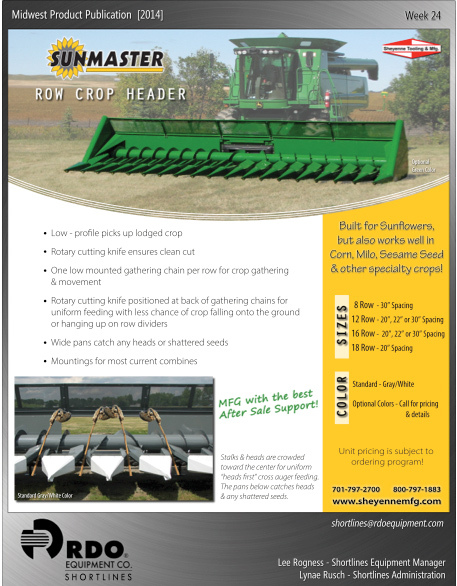 If you want to add more horsepower to your bottom line, contact Alan Graff at agraff@versatile-ag.com or (920) 819-9039. RDO had determined that if it was going to maintain and grow its shortline business, dedicated resources were needed. After helping the Fergus Falls employees transition to RDO, Rogness took on the role of leading the newly-formed Shortlines office. Rogness adds that the information piece becomes vital to the process. 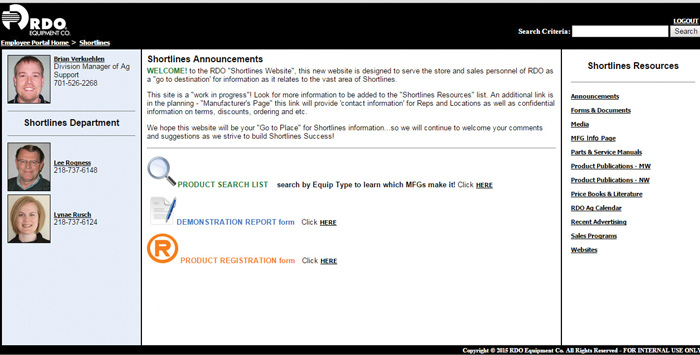 In 2009, he and Rusch started conceptualizing an employee Web portal that would become the organizational and communication channel for all shortline products (see below). “There’s now continuity throughout the operation and all employees have access to the same information at the same time,” says Rusch. RDO Equipment's Shortlines Office, Fergus Falls, Minn. The Shortline Office's role is to use the processes and procedures established by the RDO Field Support Office (FSO) to “connect the dots” on shortline products and assist and give energy to the sales function throughout RDO. The Shortlines office has come up with predictable pricing based on proven inventory costs so the salespeople have confidence in the pricing. “Our objective has been to get constant pricing upfront — taking out the highs and lows — that will be good throughout the year,” he says. Regardless of the time of year the sale is made, the salesmen know the pricing, he says. The head of the Shortline office reports to the Division Manager of Ag Support and provides a weekly report to communicate what they are working on and why. Today, Shortlines revenue is about 4 times higher than in 2009. Rogness believes that a choice helps the sales process, and as a result RDO offers options in most specialty equipment categories, usually with 2-3 lines. Pictured in front of a sampling of manufacturer-provided brochures, Lynae Rusch is the administrator of the Shortlines office at RDO Equipment Co. She is the liaison between salespeople and their shortline manufacturers, and oversees and updates an Internet-based employee portal to make information easy to access and to ensure accuracy and consistency — a challenge with the number of manufacturers involved. He explains that RDO works hard to create an environment where customers are happy with the John Deere product and don’t seek out a competing choice. But if there was a true demand for a product from an outside line, Rogness says, RDO would be studying it and making a determination if it has the critical mass and opportunities in repeat sales to bring it on. After joining RDO, Rogness saw first-hand the challenge of managing hundreds of shortlines within a large dealer group. The shortline manufacturers who knew Rogness well shared their frustration about getting lost in a large-store pond. Because of a lack of stock and PO numbers (“not workable in RDO system,” he says), incomplete paperwork could end up in a “black hole.” The problem was that manufacturers didn’t know who to call to get it resolved. Processes were needed to streamline everything on both the front (where accuracy can be controlled) and back end, and that’s where he and Rusch came in. John Deere isn’t likely to promote the idea of a dedicated shortline department, but Rogness says the system is good for Deere because of the transparency. “We have an excellent relationship with our rep and talk about it. He would come into the picture if/when there’s awareness there’s a void in a segment or with a product. “We'd look into whether we’d best meet a specific need through a shortline product. Sometimes Deere’s got something in prototype stage that’s close to production, and in some instances, that may meet customer expectations. Below is an overview of some of the key elements with the Web-based employee portal that all RDO personnel can log into to access information on “all things shortlines.” The system will soon undergo another evolution, but here is a sampling of just a few of the key informational points that RDO employees can access. 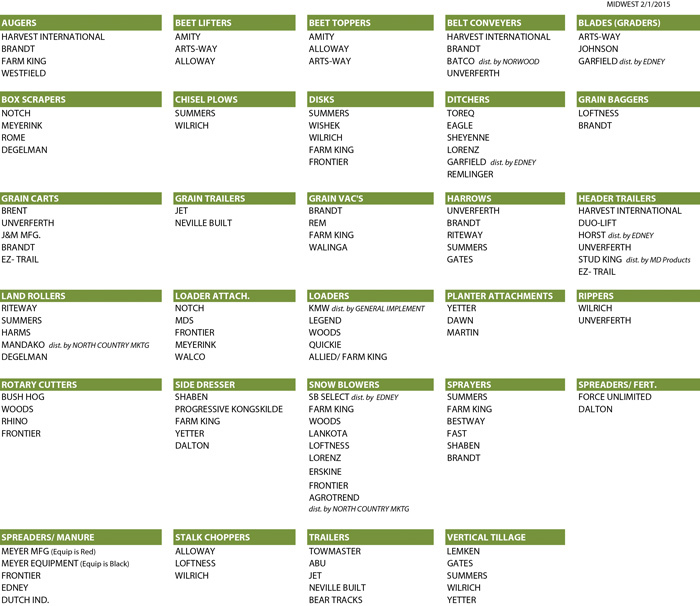 Product Search — Here, salespeople can easily see some of the common lines that RDO has to offer in an alphabetically organized product category, such as augers, beet lifters, beet toppers, etc. There are typically two brands available in each product category. “It’s a resource for dealership employees which spans every experience level and background, to see what choices we could help the farmer with,” says Rogness, noting that the list is always changing. If a farmer arrives with another line in mind, the list will help the salespeople readily identify an alternative brand RDO has access to and can present the merits of why the company inventories that particular brand. Manufacturer’s Info — Listed here are updated contact info for the manufacturer contacts, locations and confidential info on terms, discounts, ordering, etc., as well as the official dealer log-ins and passwords for each manufacturer. The employee portal also is home to any incentive programs from the manufacturers. “It all goes onto the portal for one go-to-place — not only to know about all programs, but to know where to find them,” says Rogness. Literature, Publications & Advertising — Each Monday, Shortlines sends out a 1-page PDF “Product Publication” that highlights a specific shortline product. Formatted into a consistent, easy-to-understand layout with photos and talking points, these pages keep shortlines top-of-mind with the salespeople who have many products and brands to stay abreast on. The ability of the salespeople to easily locate the same ad message the customer saw is also useful, says Rogness. “The customer might recall seeing an ad but not the specifics. Because the ads are also on the employee portal, salesmen can go in and instantly see what the customer saw — without having to stay on top of every ad slick that may have run in the paper. Salesmen don’t like it when they’re caught off-guard,” he says. Because there are so many different forms, the Shortlines team spoke with manufacturers about the key, “must-have” info. The result was an enterable, Web-based form with the primary info in one place (the make, model, serial number, size, purchase and delivery dates, and all contact info for the purchaser) that goes directly to the Shortlines. Because it’s used across the board, it’s streamlined and familiar to salespeople. Product Demonstrations — The days of the old dropping off a unit with a farmer to try out on the back 40 for the weekend are over, says Rogness, noting that RDO’s demos are performed by trained personnel and with objectives and costs outlined. Documenting the demo, which is streamlined through the company’s online form, is an important piece. Included with the dates, personnel, serial and stock numbers and other key information is a statement of who was present (the owner, the hired man, the neighbors), the type of demo (tillage, planting, etc. ), a description of conditions (wet/dry, standing corn stalks, stubble, etc. ), the general results and the prospect’s reaction. She adds that because a John Deere tractor accompanies tillage demos, the information gathered up by the form is of more use than to just that shortline product. Parts & Service Manuals — RDO has started storing shortline parts and service manuals on the employee portal as a “go-to” location. While still a work-in-progress, the online storage of these manuals increases customer satisfaction because personnel can get their hands on them quickly at the parts counter or email them to the customer in real-time. Pricing — For products within RDO’s inventory, salespeople utilize a separate inhouse business system with CRM capabilities that RDO developed last fall. For requests not in inventory, they use the employee portal to develop a quote. They’ll open the manufacturer’s price book within the portal and see a lead page with RDO’s discounts to see what to apply to the price book. Rusch says PDF software allows her to box and highlight specific pricing. In the next evolution of the employee portal, and with more real-time pricing, the portal may no longer have price books but a log-in to the manufacturer’s site. In the meantime, however, they have it covered. Because Rogness worked to instill a culture of “Send it to Shortlines,” the salespeople notify Shortlines as they come across any pricing or program changes. Because of the volume of vendors RDO works with, that communication is critical, says Rusch. And while Rogness and Rusch are there to answer questions via phone or email, each question allows them to point to a Web link to help find the answer — and other information — on the portal the next time it arises. It then becomes a teachable moment, says Rogness.